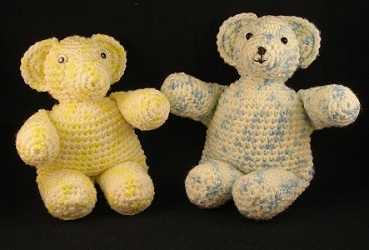 The Cuddle-Up Teddy Bear is one of my favorite patterns. It's from the Spring 1997 issue of Crochet Digest. 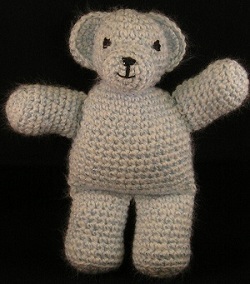 I have made many of these little bears. 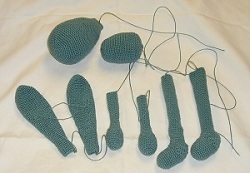 I sometimes vary the pattern a bit by making the body a lttle larger or the legs a little longer. in the Premier Issue of Crochet With Heart. I'm not real good at embroidering the eyes and nose. I think I prefer using Sz 10 cotton. I much prefer using sew on eyes. ... then, it's just cute. 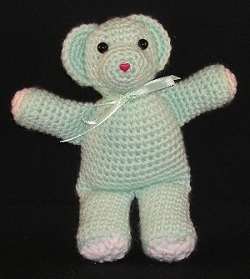 The bear is the Cuddle-Up Teddy Bear from Crochet Digest is about 8 inches tall. 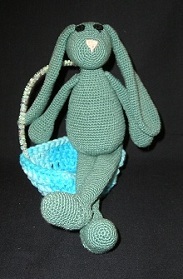 The Bunny is the One Skein Bunny from Caron. 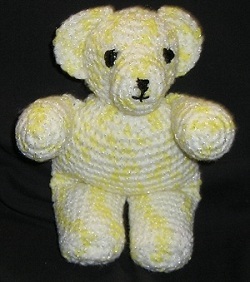 Made with worsted weight yarn, he is about 21 inches tall. 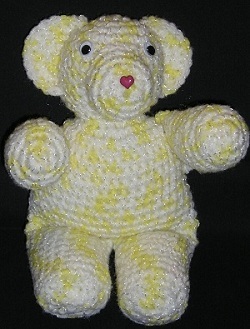 Mine is made with Size 10 thread and is only 10 inches tall.